It has been a week of strange experiences. I mentioned in passing to our lovely local journalists that I was involved in a service at Dewsbury Minster called the “Rock Mass”. Obviously we have done a few of these before but this time it seems to have legs. Something to do with it being in a “Minster” and something about it being a “diocesan event”. I talked with our lovely local journalist for a whole three minutes whilst she wrote everything down in short hand. Last night I discovered that our paper had a massive pic of me in it and a half page article about the event. I was a little shocked at how much it focussed on me (I’m shy). For our local paper this makes sense as the Rock Mass isn’t happening here. For the people who live here I am the curio. The Dewsbury paper has a preview of the event in todays issue and it is very much about the event. Yesterday, I received a phone call from the Dewsbury Reporter asking if they could do a photo shoot for the event. Could I bring my motorbike down? 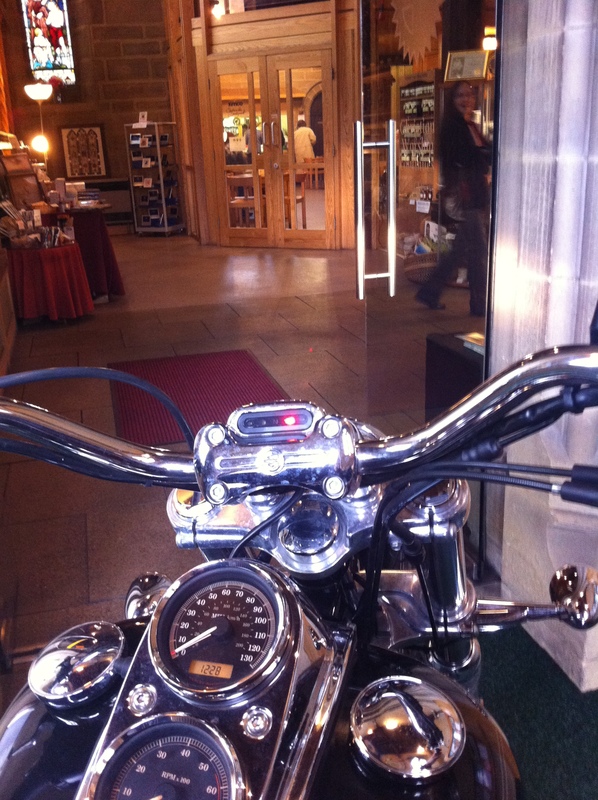 The next thing I knew, I was riding a Harley into the Minster and plonking it in the centre aisle. That is a sentence I never thought I’d be writing!! I’ll link you to the proper photo when it has been published.